Please send me more information on Baja Outback Water Adventures! With a passion for the abundant natural riches of Los Cabos, Baja Outback's team takes participants to some of the region's best surfing, snorkeling and kayaking destinations. 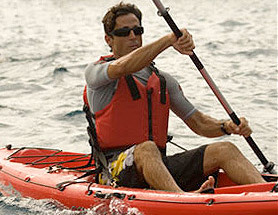 Kayak and Snorkel the Arch Kayak to the famous arch of Cabo San Lucas and visit the sea lion colony at Land’s End. Paddle through crystal blue waters and enjoy the spectacular granite rock formations that line the bay. Explore Lover’s Beach, where the Sea of Cortez meets the Pacific Ocean. Snorkel at Neptunes’ Finger and Pelican Rock where you will discover the incredible sea life underwater. This is a great trip for first time kayakers! The Arch SUP Paddle Board Trip and Lesson Join the latest craze in water sports for a couple of hours of discovery and see for yourself why SUP (Stand Up Paddle Boarding) is the fastest growing sport on the planet! 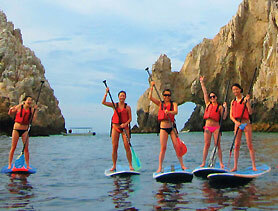 Participate in a short, fun and informative SUP lesson, given on the beach and then join your experienced guide for a paddle through crystal blue waters to enjoy the spectacular granite rock formations that line the bay of Cabo San Lucas. 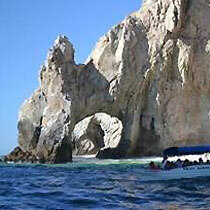 Visit the famous Arch of Cabo San Lucas and the sea lion colony. We land at Lover's beach, where you can take a scenic walk across the beach to an entirely different ocean and a beach referred to as “Divorce Beach” This is a great way to explore where the Sea of Cortez meets the Pacific Ocean as Lovers beach is one of only two in the world the faces two different oceans. Your adventure includes round trip transportation; paddle board and gear, expert bi-lingual instructor, granola bars and beverages. Cabo Highlights 6 x 1 Do it all! Experience the best of Los Cabos on this fabulous one day introduction to your destination with 6 activities included in one tour. Get to know Cabo San Lucas in one day, from above and below the surface, right at the start of your holiday. Climb aboard a Glass Bottom Boat and take a ride that includes a visit to the famous Arch, the age old rock formations and the Sea Lions colony at land’s End. Enjoy free time for some of the best shopping in Cabo San Lucas. Sail on a catamaran from Cabo San Lucas in Mexico's Sea of Cortez and explore the Baja California coast as we make our way to Santa Maria Bay to snorkel among the marine life in the calm clear waters of the bay. When the catamaran sets anchor, you can snorkel, swim or just relax onboard and enjoy complimentary national drinks and a light lunch. This tour is approximately 8 hours (departs at 9:00am and runs Mon-Tues-Thurs-Sat) and includes a professional guide, round trip transportation, glass bottom boat, tequila sample, time for shopping in Cabo San Lucas, snorkel at Sea of Cortez, light lunch and open national bar.